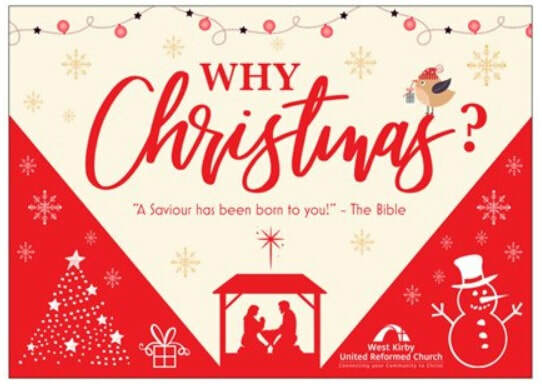 Come and see what the fabulous children of West Kirby URC have in store this year! why we still celebrate Christmas today. A special event for the local business community to network over mulled wine and mince pies. Work in West Kirby? Come along! A celebration of Christmas with traditional music, familiar words, cake and conversation. at this crazy fun service for all ages! An extra special service of celebration – everyone’s welcome! Christmas at The Bookshop on Wednesday 5 December and 12 December, 10am-1pm in the Church Entrance Lounge. Pop in for a browse at a great selection of Christmas books, CDs, cards and gifts, plus a free cuppa! Thursday 6 December, 1.45pm in the church entrance lounge. All welcome! Christmas Comedy with Tony Vino. Book your tickets (£10 adults, £5 accompanied 12-16s) with Paul - 625-3998 for a great night of "Laughter with a Platter". Bring your own bottle, if you wish. Saturday Kidz have a Christmas special on Saturday 8 December, 3.30-5pm in Church. All children of full-time primary school age are very welcome to this free club! Saturday 8 December, 7.30pm in the church. Find out more here. Toddler Group have their Christmas parties on Friday 14 December, and everyone's welcome at Christmas Toddlers for Dads on Saturday 15 December, 10-11.30am at West Kirby URC. Look out for a Biscuit Giveaway to our neighbouring businesses around 11am on Saturday 15 December too! We're carol singing with our hall users at Places of Welcome on 18 December and taking a Carol Service to Riversdale Nursing Home on Wednesday 19th. We're delighted to host West Kirby Primary School's PTA Carol Service on Wednesday 19 December. 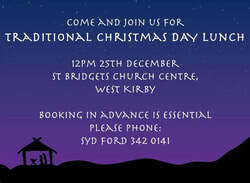 Our friends at St Bridget's Church will host a Community Lunch on Christmas Day.